In an earlier post, I laid out some of the case against getting rid of all the leaves that may fall on your land in the fall. This time, I want to explore some alternatives. 1. Do nothing. This is pretty extreme, I will grant you, especially in certain suburbs. It is the first step in a process that would logically culminate in turning your yard into a forest (at least here in New England). The trees on your land not only want to live, they want to pass on their DNA. To do that, they will produce thousands of seeds, and they will also try to shape the environment to favor their own kind. Thus, white pines will drop needles in profusion, changing the chemistry of the soil and physically blocking many of the pine’s rivals. So, if you really do nothing about your yard in this part of the world, it will soon look like the nearest patch of forest near where you live. This would not be the worst thing, but it will attract some notice, especially from neighbors who think the neighborhood should look like a golf course or a corner of Versailles. (Plus: you should probably not do absolutely nothing, or else you could end up with a forest of Norway maples, which would not be a really great outcome. See: alien invasives.) Still, if you’re up for it, go ahead to do nothing. Please let me know how that works out. 2. Fire your landscaper. Most landscapers are really not on your side. The ones I observe here in the New England suburbs are profit-maximizing businesses like any other. They want to sell you services and materials. So, they are not really interested in cutting back on the number of visits or applications of stuff like pesticides, herbicides, and fertilizers. If you decide to keep your landscaper around, then at least take charge of the relationship. Tell your landscaper exactly what you want (and do not want). You can begin by telling your landscaper not to use leaf-blowers on your place any more. Tell him (or her?) that you request the use of rakes and brooms instead. Your guy may grumble, but remember: the customer is always right. 3. Mulch your lawn. This may sound technical, but it is about as easy as falling out of bed. All mulching means is that you shred your leaves (somehow) and keep them on your own property. First, the shredding. This can be accomplished in a pretty good fashion with a regular lawn mower. You will need to mow pretty often in the fall to stay ahead of the accumulating leaves, but this is better than nothing. You can even tell your landscaper to do this. Better is to get a “mulching mower,” which is specially adapted to shredding leaves into a nice small size, which encourages them to rot, which is just another term for recycling. Rotting is a great thing for your yard — both lawn and gardens. In fact, without rotting, we would be buried in stuff that never got properly recycled. So, you shred the leaves, and if the pieces are small enough and there are not too many leaves, you can just let them drop. They will drop down to the base of your grass. There, the mulch will retain water in the soil (thus sparing you from another racket — irrigation systems. If you live in New England, you do not need an irrigation system, certainly not for the typical lawn and gardens. We get plenty of rain here.) The mulch will also rot into the soil, thus enriching it. There you go: no need to water, no need to fertilize. 4. Mulch your gardens. 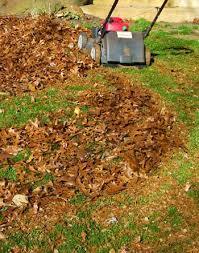 As the leaves pile up in the fall, you may find that they outrun your capacity to mulch them right into the lawn. That’s OK. You can run your mulching mower with the bag attachment and collect the shredded leaves. When the bag is full, you walk over to a nearby garden bed and just shake the contents into the garden. Let them pile up two to three inches deep. Here, they are your friends. They will rot and enrich the soil; they will limit evaporation and help retain rainwater; they will also help to suppress certain weeds. Depending on the ratio of garden beds to lawn at your place, you might be able to use all your shredded leaves on your own property. Never buy any more mulch from the nursery. You don’t need it. 5. Compost. This too may sound arcane or just daunting. It’s not. 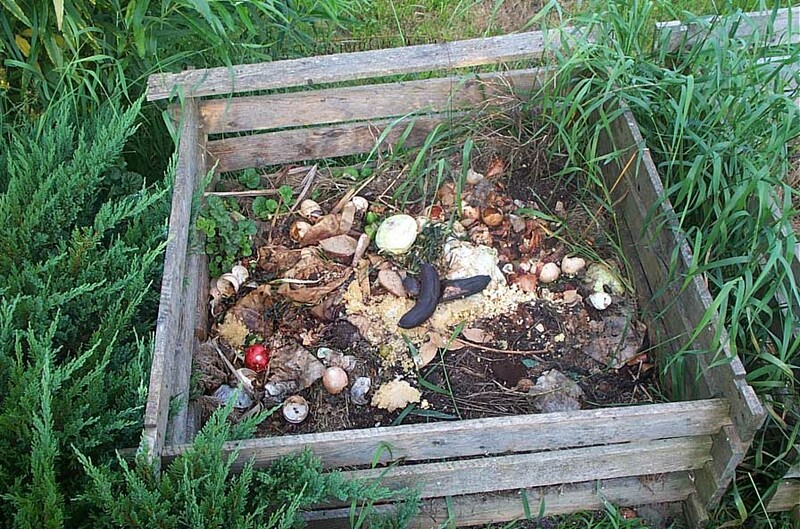 Composting is just a fancy name for a program of deliberately encouraging organic material to rot. When you compost, you accomplish several good things at once: you create your own free, natural fertilizer; you reduce your flow of garbage and other waste that has to be dealt with; and you will capture more and more of your own organic material. Composting can be ridiculously simple. You can just start a pile on the ground behind your garage. Toss grass clippings and shredded leaves on the pile, in alternating layers. From time to time, mix them up. Come back a few months later, and — voila! — there will be a load of dark, rich material that looks like a cross between plain old dirt and peat moss. Help yourself to a shovel-ful. Take it to a flower or vegetable bed, pour it on, and mix it in. Or, you can shake it lightly over your lawn. Anything you want to grow will grow better with compost. Once you get the hang of it, you can add kitchen scraps to your compost pile (but no meat or fish, please, or you will get every raccoon and skunk in the neighborhood spending the night behind your garage having a real hooey!). You can also buy a composter, which is a container for all this stuff, or make your own. Oh, yes, one more thing: it will all go better if you can divert some rainwater from your garage roof and keep your compost pile nice and moist. 6. Start a hedgerow. Huh? This too is easy. 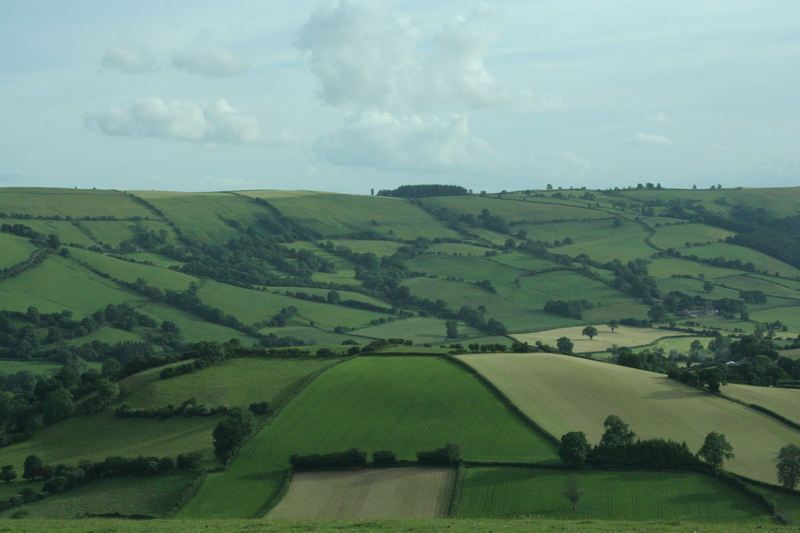 Here’s the idea: in many parts of the world (Ireland, England, France and elsewhere), farmers traditionally divided their fields by allowing or encouraging certain shrubs to grow up along the borders. Think of it as a living fence. The hedgerow not only marks boundaries, it was also used to control livestock in the centuries before barbed wire. But there’s one more benefit, too: the hedgerow is a patch of land on your property that you can essentially leave alone forever. The leaves that fall on it can just be left alone. Oh, and there’s a super bonus, too: a healthy, established hedgerow is also a home for lots of beneficial wildlife, which will appreciate the leaf litter on the ground, the cover provided by the shrubbery, the possibilities for making homes, and the food provided by any fruit or seeds yielded by the plants in your hedgerow. Here’s a way to start: go out to the back boundary on your land. Pace off 10-12 feet. Mark that line. Then, just stop mowing or weeding that zone. In a few years, you will find all kinds of “volunteers” — plants that show up all on their own, thanks to the wind or animals that disperse the seeds, and set about growing. You might want to do a bit of sorting, so that you get a good mix of native plants about the right size. Evergreens like yews and holly will get you through the winter. Fruiting shrubs like viburnums provide color and fruit. Now, if you back neighbor would do the same thing, the two of you would have a hedgerow more than 20 feet wide, which will really transform your neighborhood. So, there you go. These are all cheap, low-tech, proven techniques. Try them all. And see if you don’t find yourself running a more natural landscape. Well said. Note that many mowers come with the option of mulching–it is as simple as putting in a plate which blocks the exit hole to where the bag would be–and that mulching grass is not only better for the lawn than mowing, but saves you the trouble of emptying the bag. Check Consumer Reports mower ratings, which evaluate how well mowers mulch. A good DIY helpful hints on what to do with all those leafes nature has dropped in your yard and garden. I like the idea of using the leaves as mulch but the wind can blow pretty strongly here, is there a way to weigh them down or just put a thin layer of bark mulch on top? I find that once they get a little wet, they usually stay put. But I also like your idea of a layer of bark mulch. That should do the trick, too. Thanks. Good post, I did a similar post entitled “How To Build Great Garden Soil” I have a mulching mower with a bagger and I put a small 12″ fence around my garden and pile all my mulched leaves in the garden. It is almost all broken down by the time garden season comes around. My garden is loaded with earth worms so I know it is great for them. Why buy those lawn bags and pay for those stickers at 3.00 a pop when you have the best garden amendment for free.